(1) The $5.00 cup (weighs c. 8 oz.) 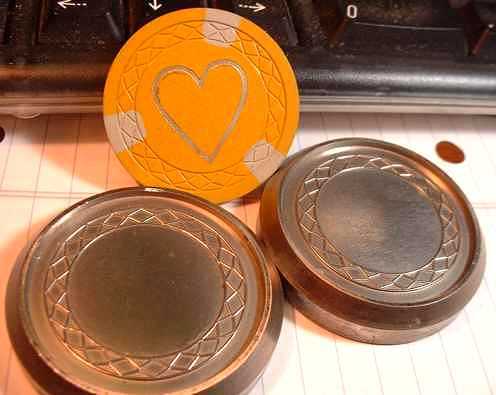 was used to make a set of chips that was rejected by the casino. These were to be the regular chips to be used throughout the casino (some 300,000 chips), but the plans never materialized. Note: behind the "$5" in the inlay is a large stylized depiction of the hotel-casino in light gray and white colors; it barely comes out in the scan above. Black's A. C. Catalog lists it as C TPP-F.
(2) The "Interlocking Star" cup (weighs c. 5 oz.) 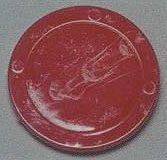 was used to make generic clay composition poker chips, namely PDNW, variation (the old WSX code), as listed in Antique Gambling Chips, Revised Edition. PDNW was made extensively during the 1940's and 50's. It is a very common chip. The above three pictures are from an eBay auction of a plastic injection mold and one of the chips that was apparently made from the mold. Note how there are four molds (hobs). 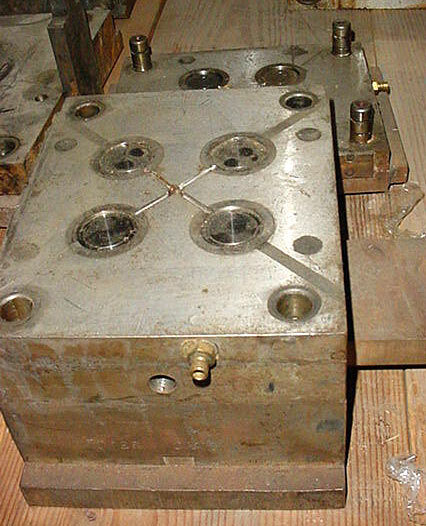 The top and bottom of the mold are aligned by fitting the four posts of one mold half into the four holes of the other half. 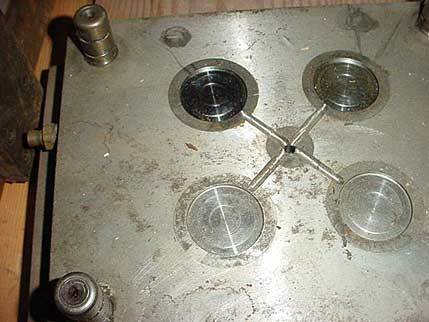 The "X" or cross shown must be the path for injecting plastic into the four "hobs" (individual chip molds). ¶ two halves of a mold for the "Cord" rim mold. ¶ one half of the "Flowers" rim mold. More of my molds -- two halves of the "Web" mold. 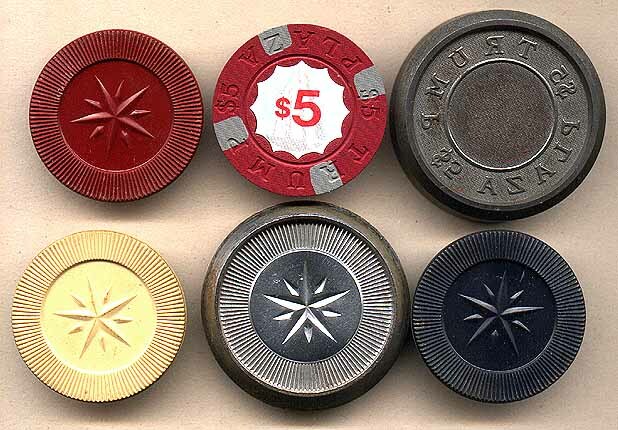 The web mold was used for illegal and home gambling games for many years. 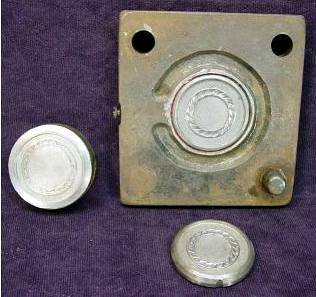 It was the proprietary chip mold of Ace Sportworks, NYC, a gambling supply house. To give just one example, it was used to make the Outhwaite's, Saratoga, NY, illegal club (1940's to c. 1950) chips.. Owning the rights to a mold, a gambling supply house could advertise the sale of "protected chips" -- that is, they would guarantee that "web" rim mold chips of a particular design and coloration would be sold to only the original customer, thus thwarting counterfeiting and ringers.